The Spring Equinox is here! Can you feel the energizing momentum as we shift from the dream state of winter to the planting phase of spring? No matter which season we shift into, I find that each one brings a fresh start. Spring is literally the freshest start of them all. Everything is awakening and coming out winter hibernation. We want to be outside and more social. There’s the pull to nourish our bodies with fresh, detoxifying greens. Spring cleaning takes place both physically and mentally. Spring is also the time to manifest the dreams and desires you conjured up over the winter. The hindrances and blocks to making those visualizations a reality naturally fall away as the earth has energy of growth and renewal. You can read more about supporting the spring shifts here. Spring is a time to release things that may have been holding you back. These are things you may have realized in the fall, sat with throughout the winter, and are now making a decision fully in the spring. Along with refreshing your space and opening up the energy of your home, I like to change my diet to support the activity and growth of the season. Eating greens, especially bitter greens, naturally detoxifies the body and helps activate renewal. Two of my favorite spring herbs that aid in detoxification are dandelion and motherwort. As Ella Wheeler Wilcox writes, “A weed is but an unloved flower.” Dandelion is only a weed to those who don’t see the amazing properties of this plant. The flowers of a dandelion are round, yellow, and are formed from numerous strap-shaped florets, each with an abundance of nectar to attract bees and other beneficial insects. There are numerous benefits to this spring herb and all parts of it are good for your body. The root helps with gastrointestinal and liver issues. The leaves aid with digestion, bladder infections, gallstones, liver/gallbladder disorders, and premenstrual syndrome, among others. Studies have even shown that dandelion may play a role in detoxifying androgens from the body. Androgens are hormones that play a role in male traits and reproductive activity. In the female body, they are converted into estrogens. Avoid dandelion if you’re allergic to chamomile or yarrow, ragweed, chrysanthemums, marigold, daisies, or iodine. Do not consume while taking antibiotics and be careful when on blood thinners and diuretics. Motherwort is also known as Lion’s Ear or Lion’s Tail. This spring herb has palm-shaped leaves, pink flowers, and square, stout stems. It grows about three feet tall and blooms in August. You’ll know motherwort by its pungent odor and bitter taste. There are many great properties and benefits for the body. It’s relaxing and calming. The astringent, bitterness of the herb helps to clean and detoxify. Also, it’s carminative, meaning aids with gas and digestion. This also has a great impact on vision and those with anxiety and sleep disorders. Motherwort is a great heart soother. Various preparations were given to patients with nervous cardiovascular conditions, hyperthyroidism, heart diseases, and hypertension. There was a decrease is blood pressure, headaches, and dizziness. The greatest result was seen in the group with nervous heart conditions and hyperthyroidism. This herb also stimulates and relaxes the uterus and has been used to regulate menses. 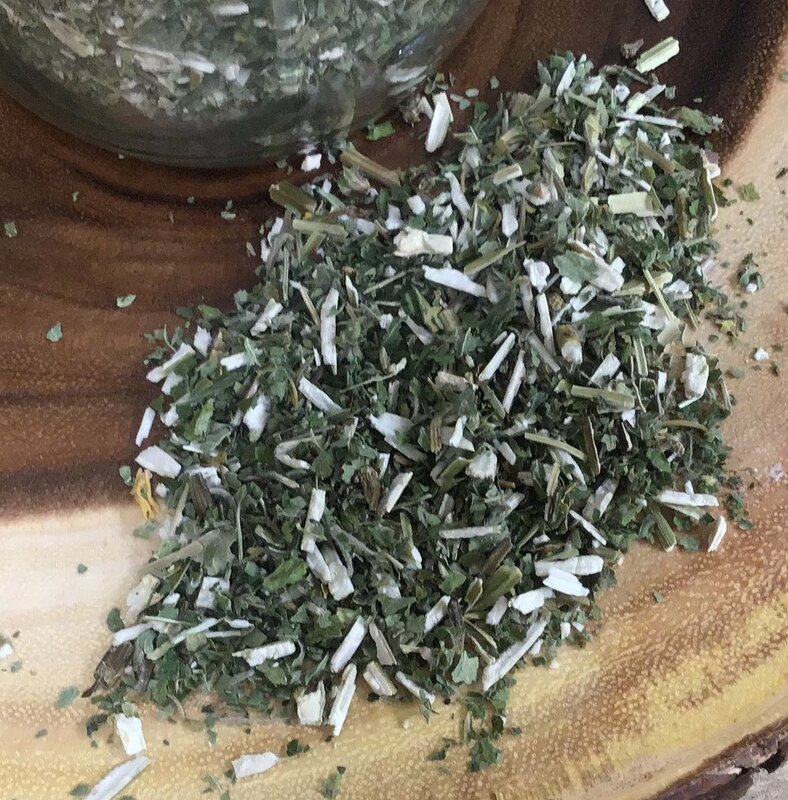 I’ve added it to my Lady’s Herb Tea because of these relaxing properties and the benefits Motherwort has on the heart and female reproductive system. Lady’s Herb Tea isn’t exclusively for women and it’s a perfect blend to relax and support heart health. Many of the herbs in it do balance and many are great for women’s wellness. Both of these herbs will aid your body in spring renewal. They’ll give you energy and protect your systems while you are doing more outward work to manifest the wishes you’ve envisioned during the past season. With the seasonal renewal comes a reminder to focus on refreshing the way you nourish your body holistically with herbs and activities that are beneficial to growth.